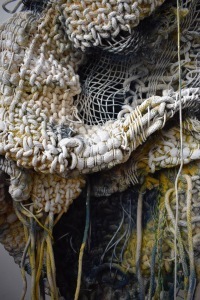 Modern Macramé Fiber Artist Feature Blog Post – Jacqueline Surdell Meet Jacqueline Surdell – JAX. 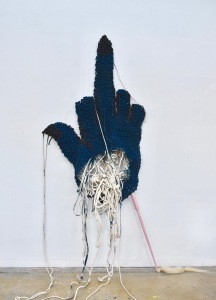 She is an interdisciplinary artist working with the histories, materials, and processes of fiber and painting. 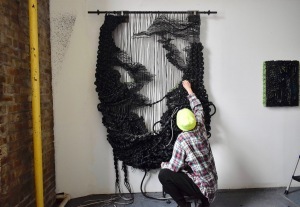 The results are large-scale macrame-tapestry-paintings thinking through the influences of landscape paintings historically and within contemporary culture. 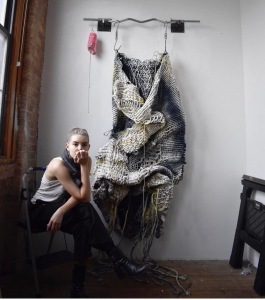 Read our Q&A with Jacqueline below: Modern Macramé Fiber Artist Feature Blog Post – Jacqueline Surdell “I’m The Star” Modern Macramé Fiber Artist Feature Blog Post – Jacqueline Surdell “No You’re The Star!”What was your process in becoming an Artist? Both my grandmother and great aunt are working artists and I was lucky enough to grow-up understanding making as a bonding activity between generations. My earliest memories are sitting on the floor of my Oma’s studio — surrounded by the lush materiality of an artist studio: paints, bushes, pallet knives of all sizes, easels, wax paper, flat files, etc. As I child I was in awe of her and her work — and remain so today! Modern Macramé Fiber Artist Feature Blog Post – Jacqueline Surdell Growing up in the midwest, sports are a big part of life. My Dad went to college on a football scholarship and my brother and I spent many an afternoon running plays in the alleyway behind our home. Sports made me feel strong and capable. I can still throw a perfect spiral ;). Around the age of 10 I began playing competitive (year-round/travel) volleyball. I was recruited to play volleyball at Occidental College in Los Angeles where I simultaneously painted, sculpted, and started exploring large-scale macrame. The building up of knots, of something relatively small to eventually make something large, struck me as similar to the ways in which exercise works for the body and ideologically how a successful “team“ works. It just stuck. 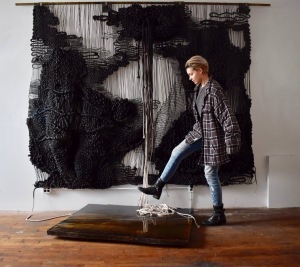 The laborious process is physically demanding while the forms themselves are similar to organic topographies and historic landscape paintings. What is the most inspiring piece of advice you ever received? My second semester senior year of college I took a journalism class. The professor is a working editor who brought in journalists to lecture on their experiences and work. The class was riveting and each guest speaker inspiring in their own specific way. I learned, perhaps not “advice” from this course / professor, but the value of curiosity in practice: asking questions. I learned to be critical, skeptical, and then ask how will this work? why this? why not this? what about this? This translates to the courting of the unknown in art making rather well. 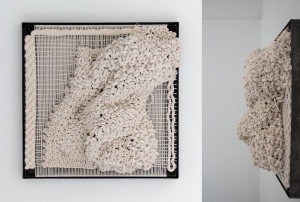 Modern Macramé Fiber Artist Feature Blog Post – Jacqueline SurdellHow do you define yourself or your work? I asked my mom one word to describe me and she said “effervescent” – and explained that it was vibrant, celebratory, and often unexpected / dangerous. She knows me, and it makes sense. Modern Macramé Fiber Artist Feature Blog Post – Jacqueline SurdellWhat is the last great book/podcast that you read/listened to? – When I work I listen to audio books about myths, lore, and fantasy. I recently listened to the Lord of the Rings and am working on the “Eragon” series (currently on Brisenger). – Recent books: “The Gift” by Lewis Hyde and a text my Oma recommended, “Art and Fear” by David Bayles and Ted Orland. Both quick reads full of juicy thought nuggets for artists. – I often return to the work of Barbra Kingsolver; Prodigal Summer, The Poisonwood Bible, etc. I love the richness of her tone, her words, and her dynamic female protagonists. 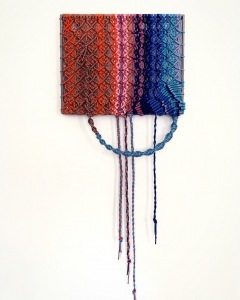 Modern Macramé Blog Artist Feature: Jacqueline SurdellWhat has been the biggest obstacle for you creatively? I struggled for a long time (and continue to struggle) with my own expectations bumping into the expectations of others. I spent countless hours worried about what others thought of me and my work, which was basically countless hours spent NOT WORKING. If I can give some advice it would be f** what other people think. At the end of the day all you have is yourself. I found that accepting this struggle liberated me in my work (and in my life). This is not to say that you should be impervious to considered critique / comments from trusted individuals, but, when it comes to your work, no one will truly care the way you care. So work that way. Work however you want. This is the anxiety and glorious agency that comes in being an artist. You have all the control and that can be terrifying. It’s just you so make it work for you. Own yourself and resist performing for others. 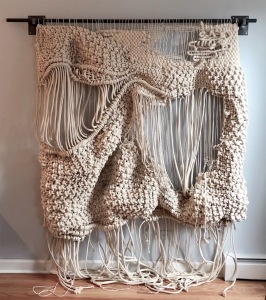 You will be happier this way!Modern Macramé Fiber Artist Feature Blog Post – Jacqueline SurdellWhat advice to you have for young artists?